Standing, standing, standing on the promises of God my savior; standing, standing. I’m standing on the promises of God. [R. Kelso Carter, 1891]. Scripture declares that Abraham stood on the promises of God, and it was credited to him as righteousness. Whether it is Paul in Romans 4 or the author of Hebrews 11, Abraham is lifted up as an example of a person who stood strong in his faith despite the lack of evidence to support that trust. Abraham simply stands on the promises of God, and in time his faith, his trust, bears fruit. The reading from Genesis 15 marks another conversation about covenant. At this point in the story, Abram’s name has yet to be changed. The promise is made, again, that Abram will have many descendants, beyond the ability to count. This is a challenging proposition, as to this point Abram’s only heir is a slave. He has no children of his own, and God makes it clear that the promise will go through Abram’s descendants. God is intending to work through Abram’s biological descendants, who will be as uncountable as the stars in the sky. Despite everything, we’re told that Abram believed God, and this was credited to him as righteousness. Abram will stand on the promises of God, but not without a word of lament. In fact, the chapter begins with God telling Abram not to be afraid, because God has his back. Abram responds, well that’s great, but what have you done for me lately? (my paraphrase). Abram is, after all, still childless and has as his heir a slave (regarding slavery, we should always remember that while widespread in the ancient world and not racially rooted, references to slaves in the Bible were used to defend modern slavery). He’d followed God’s lead from his homeland and still nothing. I appreciated what Rolf Jacobson writes concerning the power of lament that’s present in this passage and in the rest of Scripture. In the Bible, God does not desire followers who are meek and mild, compliant and quiet—at least not in relationship to God. God wants sufferers who fight back. God invites us to own and be in touch with the deepest hurts and brightest hopes in our souls. For Abram, this hope was to have a child. And after all, the Lord has promised. Abram will stand on this promise, but not before making clear that God understood what is involved in a truly covenant relationship. Having heard Abram’s lament, God says to Abram: “I am the Lord who brought you from Ur of the Chaldeans, to give you this land to possess.” In response to Abram’s question as to how he will know this to be true, God proposes a ritual to seal the deal. The directions are simple. Abram is told by God: “Bring me a heifer three years old, a female goat three years old, a ram three years old, a turtledove, and a young pigeon.” Abram does as he’s told, cutting each of the sacrifices in half, with the exception of the two birds. He lays them out as instructed and waits for God to act. The Revised Common Lectionary omits verses 13 to 16, though it retains verse 12, which seems to introduce verses 13 to 16. In verses 12 to 16, Abram falls asleep and has a bad dream. Though he is told he will die peacefully and have many descendants, he’s also told that his descendants will be forced to live in exile and experience slavery for four hundred years, though in the end, they will be blessed with an abundance of gifts. If verses 13-16 are omitted, it would be probably be best to omit verse 12, as there is some discontinuity between verses 12 and 17. On the other hand, there is a message here that is worth remembering—the covenant will be fulfilled, but not without times of trouble. If we choose to omit verses 12-16, we can move from the ritual in verse 11 to the culmination of the conversation about covenant in verse 17, we watch as the sun sets and a torch passes between the sacrificed animals, as a sign of divine acceptance of this offering of Abram. With that God makes the covenant with Abram, promising: “To your descendants I give this land, from the river of Egypt to the great river, the river Euphrates.” It is worth noting that God requires nothing of Abram at this point. Normally, covenants involve mutual declarations and actions, but nothing is required of Abram. Abram does do anything to obligate himself. It is YHWH who self-obligates. It’s YHWH who makes the promises. Of course, this is not the end of the story. The author of Genesis will revisit this issue. As the story continues, Abram and Sarai will try to fulfill this promise through a surrogate. An heir is produced—Ishmael—and then rejected. Finally, Sarai will give birth in old age to a son, Isaac, who will be the accepted heir (at least in the biblical story, the Quran will hold on to Ishmael). While the promise of an expansive realm is made, Israel’s boundaries never reached the extent promised. Nonetheless, the descendants of Abram can claim that they are the fruit of God’s promise to Abram. They are the covenant people, though the promise isn’t repeated here, Abram’s descendants are to be a blessing to the nations (Gen. 12:1-3). What this covenant promise means will be a subject of ongoing interpretation, as we see in the way in which the New Testament writers make use of God’s covenant with Abraham. The covenant made in Jesus is clearly rooted in the covenant made with Abraham. The question for us has to do with the nature of our faith. Lent gives us the opportunity to reflect on the nature of our faith journey. In what ways do we resist the promises of God, and in what ways do we cooperate. As the Psalmist implies, there is the possibility of living in fear, especially when enemies assail us. As with the promise made to Abram, we can take comfort in the presence of the Lord. After all, as the Psalmist declares: “The Lord is my light and my salvation; whom shall I fear?” (Ps. 27:1). With that old hymn, which I took note of at the beginning, we can stand with Abram on the promises of God. Picture Attribution: Gogh, Vincent van, 1853-1890. Starry Night, from Art in the Christian Tradition, a project of the Vanderbilt Divinity Library, Nashville, TN. http://diglib.library.vanderbilt.edu/act-imagelink.pl?RC=55396 [retrieved March 11, 2019]. 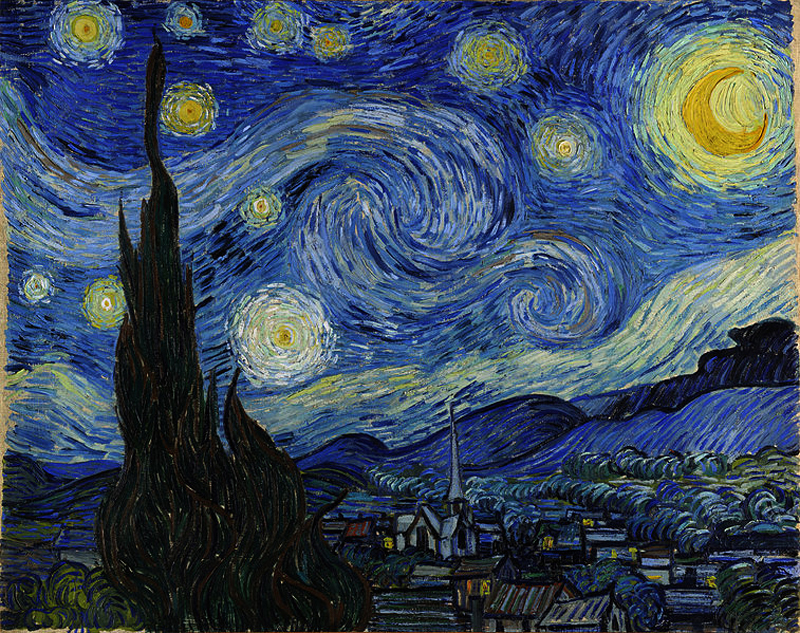 Original source: http://commons.wikimedia.org/wiki/File:Van_Gogh_-_Starry_Night_-_Google_Art_Project.jpg.